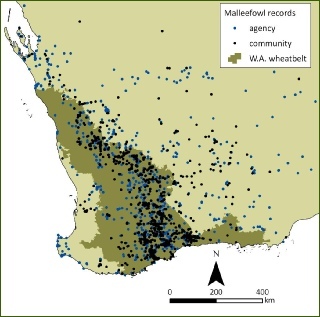 We have amassed 2861 records of the occurrence of Malleefowl in the Western Australian wheatbelt (see map below). Community groups provided much of this data - 1397 records (53% of records) - with the balance coming from various government agencies. Considerable data was provided also indirectly via the knowledge of farmers - 51 records (2%) - or through bird observers - 230 records (8%). This data records presence of Malleefowl, but not absence. The dataset was collected largely from opportunistic sightings, rather than from a structured program. As a result, the level of effort varied greatly over time and space, greatly limiting the interpretations that could be made from the data. We have made use of the presence-only dataset where possible (such as use of BIOCLIM to establish the climatic envelope of the species), but have also converted presence-only data to presence-absence data. We used extensive postal and phone surveys of areas within the Western Australian wheatbelt to establish past and present occurrence of Malleefowl and made use of past Birds Australia Atlas 2 data to derive sites of bird survey that did not contain Malleefowl. · the likely impact of fire frequency and extent on Malleefowl in the Western Australian wheatbelt.